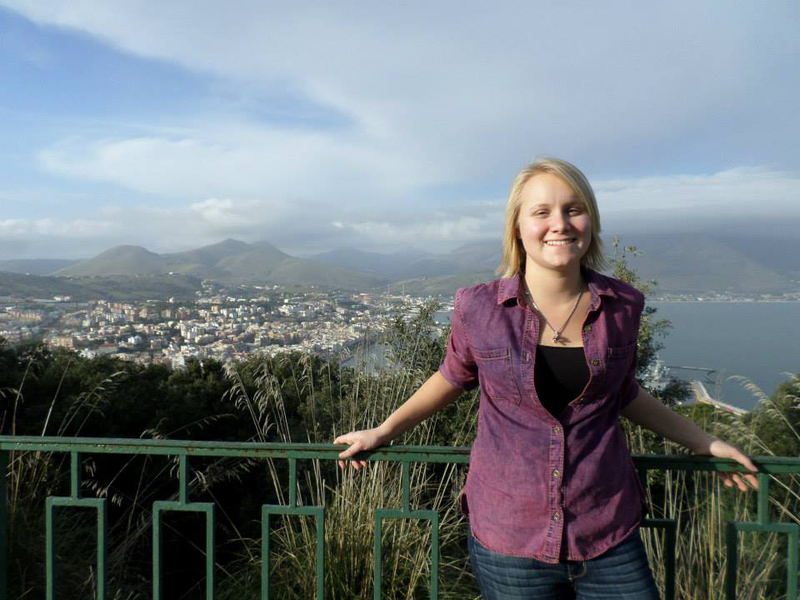 Amie Goblirsch ’16 in Gaeta, Italy during her semester study abroad experience in the spring of 2014. Every college student looks forward to the summer for one reason or another, whether its reuniting with family and friends, going on vacation, or completing an internship. For Gustavus Adolphus College junior Amie Goblirsch, this summer will be about taking part in a once-in-a-lifetime archaeological dig overseas, thanks to a unique gift from a Gustavus alumna. Goblirsch will travel to Redondo, Portugal this summer to participate in the Santa Susana Archaeological Project. The project, which is approaching its third season, is attempting to excavate an ancient Roman villa. The opportunity for a Gustavus classics major to participate in the project came to be thanks to a generous offer from Gustavus alumna and classics major Emily Kehm Smith ’06 and her husband Austin. Goblirsch, who is the current president of Eta Sigma Phi, the Gustavus chapter of a national classics honor society, was selected by the department. The site of the excavation holds a villa complex important to the understanding of the processes of colonization and settlement in this particular corner of what was the Roman Empire. Preliminary work at the site suggests a rich artifact assemblage dating from the 1st century C.E. through the 5th century C.E. Goblirsch and other field school students will receive instruction in surveying techniques, the handling and processing of artifacts, and the recording of exposed areas and features. She will also have an opportunity to work with a fellow Gustie in Betsy Bevis ’00, who is a graduate student at Johns Hopkins University and one of the project’s supervisors. Goblirsch says that she decided to study classics at Gustavus because it had everything she wanted to study—language, history, poetry, and music—combined into one major. She has also been impressed with the quality of the faculty in the department. In addition to her academic work in the classroom, Goblirsch plays the trumpet in the Gustavus Symphony Orchestra, the Gustavus Wind Orchestra, the Adolphus Jazz Ensemble, and the Frost Jazz Combo. She also plays on the women’s rugby team and is one of five Gustavus students participating in a collaborative research project under the guidance of Professor Eric Dugdale called the Homer Multitext Project, which seeks to present the textual transmission of the Iliad and Odyssey in a historical framework. More information about the Santa Susana Archaeological Project is available online at santasusanaproject.com.